Size : 5.3 x 7.3 inches. / 13.5 x 18.5 cm. Description :Important birds-eye view of Saint Gallen (Sankt Gallen) in eastern Switzerland. 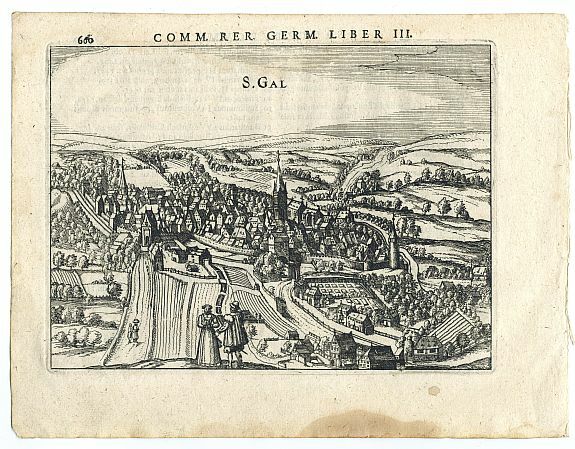 St. Gallen was already well known in the 17th century for its important manufacturing of high quality textiles. The view shows the city from west, with the old Gothic tower. Local personage in front. Lovely illustrated and very detailed. With Latin text on verso. Condition : Good dark impression. Paper toned, only slightly soiled and damp stained to margins. One tiny pinhole to top borderline. Faint show through of text from verso. Image very clean.